Knowing these details in advance will help you to narrow down the choices much more efficiently. Stable rug:Stable rugs are usually made of synthetic fibres with a polyester filling. They come in a wide range of designs and weights to suit different circumstances. Under-rug:Under rugs can be purchased if extra warmth is required. Sweat rug:There are many different types of sweat rug now available. Sweat rugs work by wicking moisture away from the horses skin, allowing the horse to cool down and dry off without catching a chill. Waterproof/turnout rugs:Waterproof sheets are available and can be used at competitions to cover the horse in between classes. Turnout rugs are lined to allow the skin to breath but also protect the horse from the elements. If you are looking at waterproof turnout rugs you should consider the denier rating. This is the durability of the fabric, the higher the denier, the more hard wearing the rug. Stable rugs and turn out rugs come in different weights to cater for the season and location of the horse, ie. whether he is kept indoors or outdoors. The filling of the rug is measured in grams to give the weight and the weight tells you how warm the rug is. The higher the grams in the rug, the more insulation, therefore keeping your horse warmer. It is important to look at your horse as an individual when making a decision on what weight is required, as different horses have different requirements. Lightweight rugs can have anything from no filling up to approximately 120g. Lightweight rugs are suitable from summer through to early autumn. Medium weight rugs can range from approximately 180g to 240g. A medium weight rug is often used by heavier horses who do not require heavy insulation during the winter months. 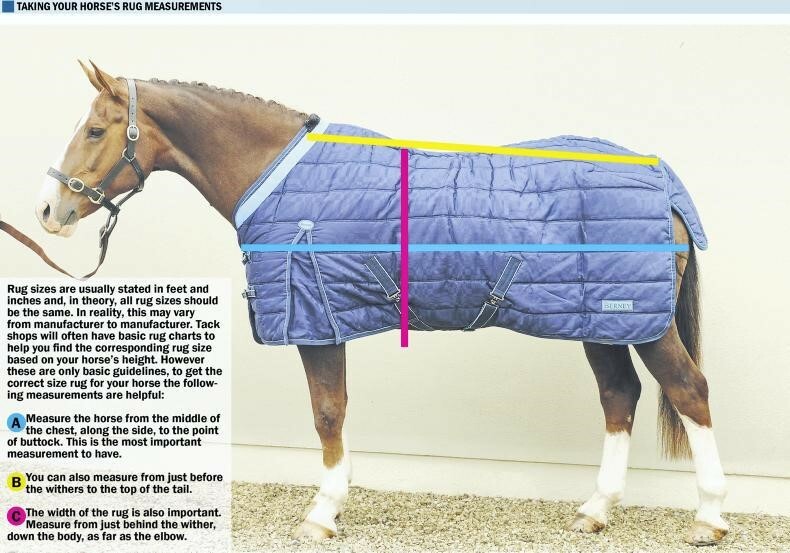 Heavyweight rugs are designed to protect your horse from the elements and typically weigh 300g+. A heavyweight rug is ideal for a clipped horse in the winter months; it is important to insulate them as they have lost a layer of warmth removed. Layering rugs is an effective way of keeping your horse extra warm and is often better than using one big rug as it traps air between the layers. A native type with a thicker coat is unlikely to need such a warm rug. Nearly all rug types can now be found with an added neck piece. Whether detachable, fixed or high neck styles, neck covers are ideal for keeping in heat, as well as keeping horses drier and cleaner in the cold, wet months. Just be aware that they can cause mane rubbing – this is more common with detachable neck pieces. Always go for a rug that is cut fairly high over the withers to eliminate rubbing and pressure around the withers and chest. Place the rug on the horse slightly in front of the withers and fasten the chest straps so that the fabric overlays. Ideally the chest straps should be able to be fastened on the middle adjustment to allow the rug to be tightened or loosened when necessary. The rug should be gently slid backwards until the front seam rests naturally forward of the withers. Most people go to the back of the rug and tug it, avoid doing this as it usually makes the rug too tight across the chest. Run your hand between the rug and around the horse’s chest, if you can’t fit your hand in you will know that it is too tight. The rug should cover the body down as far as the elbows and the top of the tail flap should rest at the top of the tail. It is important when fitting a rug that you ensure it does not gather up on the hind quarters. A badly fitted rug will not lay flat on the horse’s back end and so expose some of its coat, and cause rubbing on pressure points such as on the point of the hip. If the rug is too big and drapes over the horse’s back end. The horse can easily get caught up in the rug or get attached to a fence or wire in the field. Also, bear in mind that a rug which is too large can cause as much rubbing as a rug which is too small. Check that the surcingles fit around your horse’s belly, remembering to leave a hand’s width between the horse’s body and the straps. In some cases once the rug is completely fastened the fit is different and highlights tighter areas which you might not have seen if the rug was just placed on the horse. Some rugs have two separate legs straps instead of a billet strap that simply goes under the tail. If the rug has leg straps, the left leg strap goes between the hind legs and fastens to the d-ring on the same side. Pass the right leg strap between the hind legs, through the left strap and attach to the d-ring. Straps should not be too tight to cause rubbing, but tight enough, so when your horse rolls it does not catch its legs in then when getting back up. If your horse suffers from shoulder rubs, there are a number of ‘bibs’ which can be worn under the rug to prevent rubbing occurring. They are available in a range of different materials such as satin, lycra and quilted fabric.